Happy World Cat Day, Cody! Happy world cat day and have a tremendous Thursday Cody. Happy World Cat Day, Cody!! Happy World Cat Day to one of the worldliest cat buddies I know! Happy World Cat Day, Cody! Of course, I'm sure at your house, just like at ours, every day is world cat day. Happy World Cat day to you too! Happy World Cat Day, everyone! We hope you get some extra love and treats today! I just got your comment on my blog. The whole situation with Jewel is incredibly sad, but it's not one that I can publish on my blog yet. I don't mind sharing what's going on, though. Just e-mail me if you want to know (fureverywhere [at] gmail [dot] com. Happy World Cat Day, sweet Cody!!! Hana and Akua accept and say Hi. Thanks for letting us know about World Cat Day, Cody! Gryphon and Amelia are trying not to let it go to their heads... which are currently adorned in crowns. Where did they get those? Cute graphic! Happy World Cat Day from Merlin, Gris Gris, Domino, Odin and mom Layla. Happy World Cat to you too Cody. We sure hope you have a great day. Happy World Cat Day, Caren & Cody!!! You are so cute Cody! Happy World Cat Day Cody and Caren...hope Dakota is helping you celebrate!!! Happy World Cat Day to the both of you! Love the pic of Cody it has a scifi feel to it! Happy World Cat Day Cody. Thanks for that I never knew there was a world cat day, Happpy world cat day Cody. Yay! Happy World Cat Day!!!!! Happy World Cat Day Cody! Cody that is a pawsome graphic! Happy WCD!!! On behalf on Penny the Jack Russell dog and modest internet superstar, I, her alleged human, sort of wish you A Happy World Cat Day. Which world would that be then? Are you sure that's planet earth? Oh Cody! Yous makes the purrfect picture for world cat day! Happy World Cat Day Sir Cody! That is such a great graphic! Right back at ya Cody! Happy WCD! And a Happy World Cat Day to you too, Cody! We celebrate every day. We hope your day today was absolutely wonderful!! 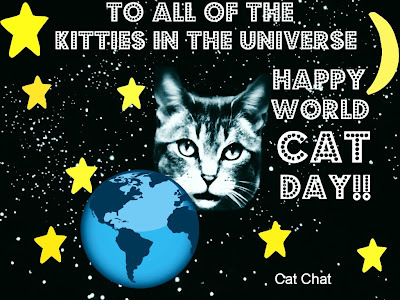 World Cat Day ... whoever dreamed this up is a genius!! Happy World Cat Day! I don't post on Thursday so I didn't get to celebrate—online. Happy World Cat Day! I enjoyed the link. Better late than never, right? ;) Happy world cat day!